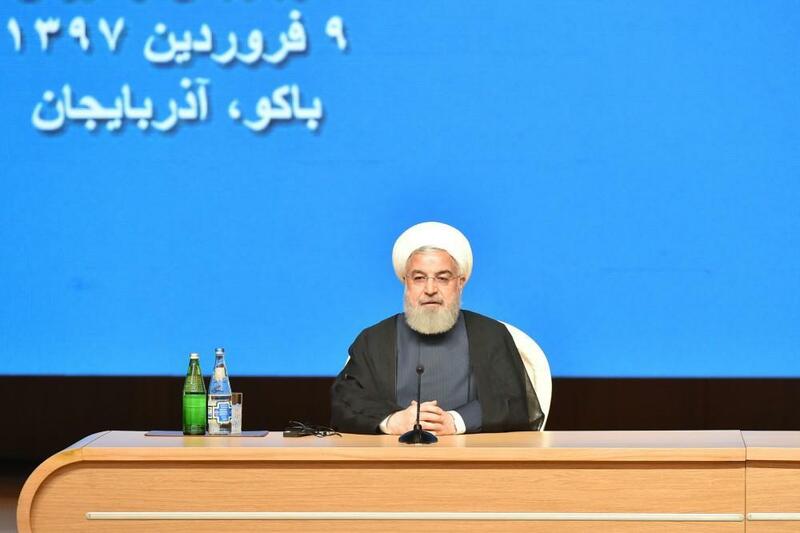 Azerbaijan’s security is Iran’s security, Azerbaijan’s development is Iran’s development, said Iran’s President Hassan Rouhani, addressing the Azerbaijan-Iran business forum in Baku March 29. Hassan Rouhani called on businessmen to be active in the implementation of joint projects. Speaking at the business forum, Rouhani said that both peoples are very close to each other in terms of religion, history and traditions. He noted that friendship and cooperation, as well as joint activities of the two countries are in the interests of the whole region. Having noted that the relations between the two countries have become useful for the whole region and the world, the Iranian president stressed that the adoption of historic decisions during the visit will serve the well-being of the two peoples. Rouhani spoke about the importance of the Memorandum of Understanding on the joint use of the relevant blocks in the Caspian Sea and added that the Caspian Sea is a sea of ​​cooperation, security and friendship. He noted that the two countries cooperate well and are close to each other as part of international organizations, and stressed the importance of the International North-South Transport Corridor project. The Iranian president expressed confidence that the work carried out regarding this project will bear fruit. Underlining that the previously unused potential of the two countries has been activated by the initiative of the Azerbaijani and Iranian presidents, Rouhani spoke about the importance of joint economic ties for improving the welfare of both peoples. He noted that there is good potential for expanding ties in the healthcare, pharmaceuticals, banking sector, agriculture, transport, electricity and trade spheres. Iranian president stressed the importance of using tourism potential by the two countries and spoke about the importance of intensifying trips, strengthening ties in the cultural sphere between the two peoples.